Description: CN 2599 leads train CNDM across County road 42. Description: The WC has just pulled up to the light and will wait for a crew to take the train to Stevens Point. The car on the left is the conductor coming to get the engineer. Description: CN 2599 leads A406 out of New Brighton and towards Stevens Point WI. This was about a two minute exposure. Description: A pair of GE's thump across the pedestrian crossing before coupling onto their BN cars. 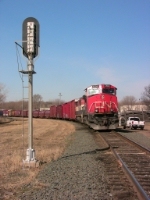 Description: CN 2599 leads another westbound through town. Title: CN 401 at Laurier station. We can see a Track mobile on the loading. Description: Its about 10:00 Am and the WC is done for the day. An added bonus was the BCOL 4616 trailing. Description: The run-thru manifest from CNs Taschereau Yard in Montreal to CSXs huge yard in Selkirk, NY enters the St. Lawrence Sub at "BROUSE" and will pick up 36 cars in Norwood. Description: B798 passes the vast landscape of the North Country region of New York State as they approach Massena with 44 mixed and five intermodal.